Have you ever gone for a run only to have your earbuds fall out constantly? Or has the wire on your headphones ever caught itself on a piece of equipment at the gym? Many problems can arise with wired headphones especially when running or working out. So, as you can imagine, wireless headphones have become very popular. Actually, let me rephrase that…they have become very VERY popular. But even with their high demand, you still run into a problem with wireless headphones. Here’s the problem: a lot of different companies have come out with many different variations. And with so many wireless headphones on the market, it’s becoming increasingly difficult to determine the best version for you. That is, the best version for your specific needs. So, whether you run long or short, or you enjoy an easy or hard workout, it can be challenging to make the best decision. That’s why I put this guide together. Being a runner who always wears headphones, I understand the importance and power that music can have on your workout. So, this guide will not only teach you how to pick out a pair of wireless headphones, but I compiled a list of the top models in 2018. This will make the selection process much easier for you. So, read on and get ready to find the best wireless headphones for YOU. When choosing a pair of wireless headphones, you need first to choose the headphone fit. There are four types of fit: in-ear, earbuds, over-ear, and on-ear. In-ear headphones compress inside your ear canal. They tend to be the top choice for running and working out. That’s because they provide a snug and comfortable fit. Most of the time, these headphones will come with different size rubber or foam tips. The variation in tip size will ensure you find the right fit, so they don’t fall out. The best part of in-ear headphones may be the noise isolation when you run. Running outside can be noisy. In-ear headphones isolate noise the best out of all headphones. Focusing on your music now becomes much easier, ultimately empowering your run to help you run faster and longer. Earbuds rest right on the outside of your ears. What’s most attractive with this type of fit is their price. Most earbuds are offered at an affordable price. However, they are more likely to fall out when running or working out than other fits. Around-ear headphones have ear cups that wrap around your ears. In most models, there will also be an earbud that inserts directly into your ear. This type of headphone fit is my personal favorite for running. I like how they wrap securely around your ears, so you can run without them falling out. Most around-ear headphones have excellent sound quality and do a great job minimizing outside sound. On-ear headphones do just that, sit on top of your ears. They are the headphones that look like ear muffs. They aren’t the best for running long distance but are comfortable for a quick run or workout. If you look around, you will notice the gym is filled with this type of headphone. Beats by Dre made them fashionable. So, if you are looking for a comfortable, trendy, great sounding pair of headphones, then on-ear is the way to go. Although we use the term “wireless” to mean ALL wireless headphones, there’s a little more you should know. There are actually two types of wireless headphones: cord and true. Allow me to explain. Cord wireless headphones are wireless from the music device, but a cord is used to connect the earbuds together. This was the first type of wireless headphone to hit the market. The plus with a cord is you reduce the chances of connectivity issues. However, the downside is you have a cord flapping behind your neck. Most headphones come with a way to secure the extra slack, but I do something better. When I go running, I wear a hat and tuck the cord under my hat. Now I get the reliability of a wired cord, but don’t have the nuisance of a wire flapping around behind my head. True wireless headphones come with two SEPARATE earbuds, no cord. All you need to do is pop each one into your ears and turn them on. The benefit of true wireless headphones is you eliminate wires COMPLETELY. The downside is they are easier to lose. But some headphone companies have a tracking function to help with this. Also, technology is not perfect, so you increase the chance of connectivity issues with true wireless headphones. First, how long does the charge last? Does the charge last one hour? Two hours? Five hours? This becomes most critical if you plan on using them for running. For example, let’s say you are training for a marathon. Longer runs on average take around 2-4 hours. So, if your wireless headphones only last for 2 hours, you are stuck running half your run without music. For my long runs, I stick a cheap wired pair in my pocket for backup in case I miscalculate charging time. Next, how long does it take to charge? Find out how long it takes for a maximum charge. Most wireless headphones will fully charge within an hour. Simply stick them on the charger when you wake up, get ready for your workout, and grab them on your way out the door. Or to be safe, put them on the charger before bed. Last, how does it charge? Cord wireless headphones typically plug directly into the wall. In this case, they come with an adapter cord. One side of the cord connects to the headphones and the other sticks in a USB outlet. Most of the time you will use your cell phone USB adapter and plug your headphones into the wall. True wireless headphones charge a little different. They have a chargeable pod and most pods also charge. So if the pod is charged, all you need to do is stick the earbuds into the pod. Now you can bring your pod with you and charge them without having to worry about finding an outlet. When shopping around for wireless headphones, you may stumble upon a few unfamiliar terms. It’s easy to get confused if you don’t speak the technological language. Companies don’t do the best job in their explanations. So, allow me to help translate some of these terms. When wireless headphones are “noise-canceling”, it means they eliminate outside noises. Now you can listen to music with no distracting ambient noises. So, if you are looking for a clear and crisp sound, then make sure this feature is included. A microphone is best for people who plan on taking phone calls during a workout. If you are at the gym between sets and your significant other calls, then you can click over and talk without pulling your phone out. I use this feature when I’m out on a run and receive an urgent call. Usually it’ just my wife asking how much longer until I’m home. But I’ve had my old college roommate call and an hour phone call later…my run was over. Having controls mean you can change the volume or song with buttons on the headphones. Now you don’t have to take your phone out of your pocket to skip songs. I prefer this option when running because I don’t like to see the time. I prefer not knowing how long I’ve been running. This helps me run further. So instead of taking out my phone and seeing the clock, I can just click the control button to skip songs. Now I can get lost in my run without ever losing focus. Simply put: make sure the headphones you buy are sweat or water-resistant. Although most are, you still want to double check. When you run and workout you naturally accumulate sweat. Also, you don’t want to damage your headphones when it rains outside. It doesn’t matter if you have a jacket hood or not, water will still find its way in…it always does. I have to admit, this is a new one for me. Some headphones now can actually monitor your heart rate. As you run, the information sends directly to your smartphone App. So now you can monitor your heart rate without some uncomfortable chest strap or watch. Just pop in your earbuds and monitor your bpm’s for your entire workout. Some wireless headphones+apps will even send you autocues as recommendations. The last term you should know is “voice command,” also referred to as “voice assistant.” When your wireless headphones have voice command, you can verbally manage your music. So if you want the song to change, well… you just tell the headphones to change it. For instances, if you have an iPhone then Siri will be built in, and you can use it the same way. Now you know some of the most important terms to look for when shopping for a pair of wireless headphones. No, you don’t need all the features, but now you know your options and can decide what’s best for you. The manufacturer should be a HUGE determination on what headphones you buy. New companies are popping up everywhere. If it was me, I wouldn’t just buy any old pair made buy just any manufacturer. Wireless technology has been around for quite some time, but it’s still relatively new. Larger more well-known companies are better with this technology. You will avoid all sorts of quality issues like poor connectivity and durability. Also, the best manufacturers have the best warranties. You see, sometimes I run far…like really REALLY far. During those runs, I encounter all sorts of weather. So, as you can imagine, running in the rain or snow can cause issues with your headphones. Well, one day my $200 pair of headphones stopped working, and you know what? I called up and had a brand-new pair sent directly to my house, no questions asked. They also sent a shipping label for the old pair to send out. So, if you go with a pricey pair of wireless headphones, by a well-known manufacturer, chances are they have an excellent warranty. 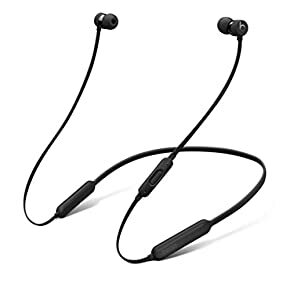 Most wireless headphones use Bluetooth connectivity. This type of connection is most reliable. Some use wireless; however, this connection is not the best choice for working out. You don’t want to rely on finding a wireless connection for your workout. When it comes to exercise, you want to make the process as convenient as possible: get in, workout, and get out. Sound quality differs from headphone to headphone. You will know the best audio sound companies because of their reputation. When you hear names like Bose (used by the NFL) and Beats By Dre (made by Apple), you know you are buying a quality sound. Yes, they cost more, but if sound quality is important to you, then it will be worth the money. And that leads us to the final aspect to consider: price. As you probably may already know, price varies widely between wireless headphones. You can buy a pair for $20 that will end up breaking, or a pair for $300 that between the quality and warranty, will last a long time. But the good news is there’re wireless headphones for everyone. But If you are an avid fitness enthusiast or a long-distance runner, I recommend putting out the extra money. Wireless headphones in the $100-$300 range will be best. The sound, reliability, and warranty will allow you to listen to all your favorite music ALL the time. Bose is one of the industry giants when it comes to audio equipment. So as you can imagine, Bose headphones are of the highest quality, sound incredible, and last a long time. The Bose SoundSport Pulse is their most popular cord wireless headphones. That’s at no surprising being that it has technology like a built-in heart rate sensor. Your bpm is actually monitored through your ear! The data is then sent to the Bose connect app in real time. This method allows you to track your heart rate zone without a watch or chest strap. Another one of its uniquely beneficial features is its StayHear tips. You will instantly feel the security and compression inside your ears. Confidently shake your head around during a workout without the tips falling out. My favorite part of the headphone, being a long distance runner, is its built-in rechargeable battery. This extends battery listening to 18 hours! That’s one of the most extended play time duration I’ve seen in the industry thus far. 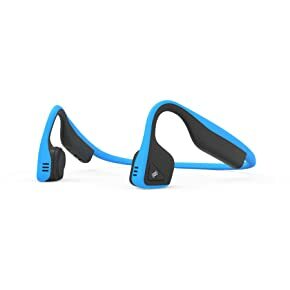 It’s users praise it for their superior sound and how the earbuds never fall out during a workout. Heart rate monitor provides real-time bpm for a more efficient workout. 15 minutes of charging provides one hour of listening time so you can charge on the fly. An excellent sound quality which helps eliminate external noise when running outside. Made by Bose which is a well-known company. 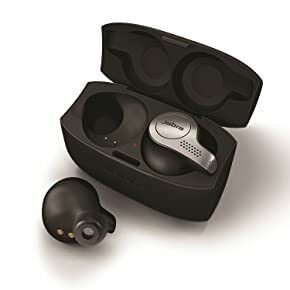 For the top TRUE wireless headphones in 2019 check out the Jabra Elite 65t. As I mentioned earlier, true wireless headphones are solo earbuds. They have no wire connecting the two sides. The connection of this model is done through Bluetooth, and you can even answer phone calls. Being able to answer calls when exercising is convenient. One of the more unique features of these wireless headphones is its customizable equalizer. With this feature, you can change the audio configurations to the custom sound of your liking. There’s even a voice control option that connects to Alexa, Siri, or Google Assistant. So not only can you control the play mode, but you don’t even have to push a button. It’s users love it for its 10-hour charging case. It feels like you are not even wearing headphones because they are true wireless headphones. You can find your preferred sound with the customizable equilibrium. Excellent warranty to protect you against water, sweat and dust damage. True headphones are easier to lose. Decent price for true wireless headphones but still on the high side. If you know anything about Beats, you probably know the artist Dr. Dre designed them. After some time, he then sold them to Apple for a whole lot of money. I’ve personally owned a pair of beats, and the sound quality is incomparable. In this model, the BeatsX Wireless In-Ear Headphones, there is a cord to connect each earbud. The earbuds then simply press into your ears providing a secure and comfortable fit. The buds are also flat with a flexible neckband both preventing the cord from tangling. These Beats headphones also take calls and controls music through Siri. They call this feature “Remote Talk.” And the sound quality is incredible. It’s user praise them for being super comfortable and loves how quick they charge. Owned by Apple so you can only expect innovation audio technology. Comfortable fit inside the inner lobes. A tangle proof design that prevents the earbuds from falling out. Neckband provides flexibility without losing its firm fit. It’s Siri connection works the best compared to other headphones since Apple owns them. Earbud cord and neck cord create a lot going on behind your head. Jaybird is a relatively newer company compared to some of the other industry giants on this list. However, their headphones have hit the running scene as of late. You will notice they have a few professional endurance athletes now endorsing them. The Jay X3 is one of the more popular wireless headphones for Jay Bird and focuses mainly on its compact design. 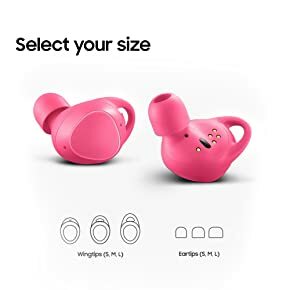 They are small and even use mini wireless buds. Their goal was to make this model as tiny as possible without sacrificing functionality, comfort, and sound. The in-ear buds come with a cord to connect them. The earbuds are designed with a patent silicone ear fin providing the listener with a secure fit. And battery life is 8 hours long! That’s enough time to get in a few workouts without evening thinking about another charge. It’s users love this wireless headphone for their supreme sound quality and small size. Comfortable fit from its lightweight and small design. Silicone ear fins compress within the ear preventing them from falling out. Excellent battery life for long runs without the need of charging. Customers have reported quality issues but say customer service is top notch. Most Bluetooth headphones will cut you off after 3-4 hours of playback. Trust me, I know, out on long runs I’ve had wireless headphones die on me before. But with the 66 Audio BTS Pro, you won’t have to worry about your headphones losing a charge…EVER. That’s because with their new technology you get 40 hours of playback! And even when you run out, it only takes 90 minutes to get another full 40 hours. These wireless headphones are an over-ear style with a hardcover cord that wraps around your neck. Plus, with a memory foam material, they sit very comfortably on your ears. Some have even said it feels like pillows. And that makes sense that they focus heavily on comfort since there’s so much battery life. If you are going use your headphones for a long stretch, you should expect extra comfort. It’s users love this wireless headphone for their durability and battery life. Super long battery life equals long…LONG playback hours. Bluetooth works 100+ feet away, so you don’t have to hold your phone when working out indoors. Durable design with hard neck cord for a sturdy and comfortable fit. Incredibly efficient charge back to play time ratio. Super comfortable on your ears. Over-ear is a bulkier style compared to others. 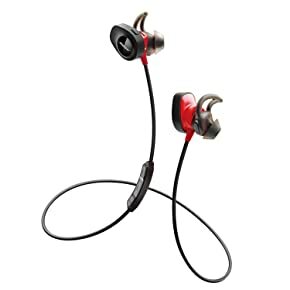 So how waterproof are the Plantronics BackBeat Fit wireless headphones exactly? Well, they can withstand fresh water up to one meter for 30 minutes. With a set of headphones capable of this level of waterproofing, sweat doesn’t even become a concern. Plus, besides their resistance to sweat, they are comfortable and secure too. That’s because they wrap comfortably around your neck with a hard cord cover and loop around your ears. If you like high bass with a crisp sound, then these are the headphones for you. Although some say they don’t play as loud as they wish, others say once you download the app and sync it, the sound becomes much louder and clearer. User praise these headphones for their durability and can confidently run with them out in the rain. Hardcover makes them durable, so you don’t have to worry about breaking them. They are waterproof so you can run in the rain or sweat during an intense workout without worry. 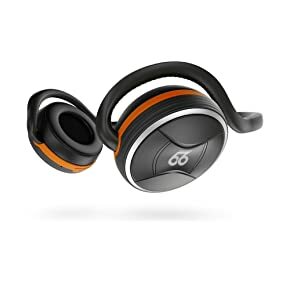 Decent price compared to other wireless headphones. Controls allow you to pause music and take a phone call during exercise instantly. Not loud enough for some. The Aftershokz Trekz Titaniums are considered “bone conduction” wireless headphones.” I know…what in the world does bone conduction mean? Well, bone conduction technology utilizes an open ear design. Simply put, it delivers music through your cheekbones. This technology was designed specifically with athletes in mind. So, let’s say you are out for a run in a busy city. Instead of canceling out ALL the noise, you can still hear some outside sound like cars on the road. Basically, your run becomes safer. Bone conduction also comes in handy during trail races if you are on a tight track. Now when another runner wants to pass you from behind you can actually hear them. These headphones are also super durable because they have a titanium wraparound headband. It’s users love them for their open ear concept. Now you don’t’ have to worry about them falling out of your ears during a workout. Bone conduction technology is convenient for intense workouts. Made with durable material making it difficult to damage them. Innovative sound quality made for athletes. Very clear conversations when taking phone calls. Too big of a fit for some. 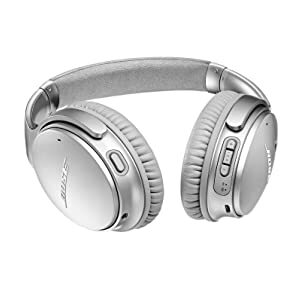 If you are looking for an over-ear pair of headphones that completely eliminate outside noise, then the Bose Quiet Comfort 35 headphones are for you. Yes, they are big, but you know what? Not everyone is looking for compact headphones. We all don’t go to the gym for intense exercise. Some rather have a clear and comfortable sound over functionality. Plus, if battery life is essential to you, then these headphones have you covered. How does 20 hours of wireless play time sound to you? Now you can charge them once and hit the gym all week without worrying about losing a charge. As you may know already, Bose is one of the best, if not THE best company when it comes to sound quality. So, you can except the best sound money can buy. Its users praise it for their excellent comfort, plus wearing over-ear headphones is a trendy look. Excellent noise canceling feature is great for the gym or even while flying on a plane. Super comfortable on the ears. Music sharing available with other Bose headphone users. 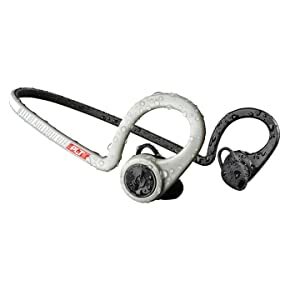 Over-ear style not that secure for intense workouts or runs. 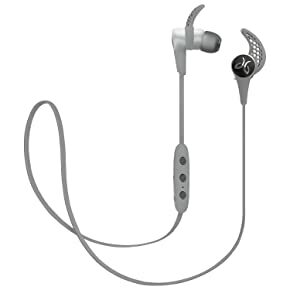 The Jaybird Run wireless headphones are great for running. They are true wireless headphones, so there’s no cord to connect the two buds. Just pop them in your ears and hit the road or trails for a run. They do not have the longest battery life with 4 hours of play time, but they come with an 8-hour chargeable case. That’s 12 hours of battery life total. Sometimes true headphones can be a little confusing when you first try them. How to charge them, what buttons to push for what connection, and other custom features. But after a few runs, the functions and controls become second nature. Plus, since they have no wires or cords, it feels like you are running without headphones. And when you are running long, this freedom of no wire makes a world of a difference. They are also sweat-proof and water-resistant. Basically, you’ll have a solid pair of true headphones for your next run. True headphones so no cords or wires will get in your way. Endorsed by professional endurance athletes. Customizable audio so you can find the sound you like. 8-hour chargeable case for extended battery life. Connectivity issues have been reported after frequent use. Low battery life compared to others. The best feature of the Samsung Gear IconX by far is the Find My Earbud feature in their Gear IconX app. Since they are true wireless headphones with no cord, it’s possible to lose them if they fall out of your ear. Well, not with these headphones. Whether you miss place them in your house or somewhere along the trails, you can now track them down with an app. Another unique feature is their ability to store songs. Yes, this pair of headphones can store as many as 1,000 songs with 4GM of built-in storage! All you need to do is add the songs, and you can use the audio control buttons to listen. Leave your phone behind and still listen to all your favorite music. Also, if you have to take your earbuds out suddenly, they will automatically turn off. This helps save battery life, although some have reported this function does not work. But don’t be discouraged because they provide 5 hours of play time with Bluetooth. Or if using the built-in mp3 player, you get 7 hours total. So, if you are tired of carrying around your phone and want a simple solution, then these are the headphones for you. It’s users love the find my earbud feature. Tracks time, distance, pace & calories burned. Stores up to 1000 songs in headphones so you can leave the phone behind. True wireless headphones, so no cord flapping around behind your head. Headphone tracker in case you lose them. Voice control so you can switch songs by just speaking. Users have reported issues with the controls and voice command. Wireless headphones are what everyone is using now for running and working out. The freedom of having no cord and the convenience of streaming music during a workout makes the experience superior to wire headphones. 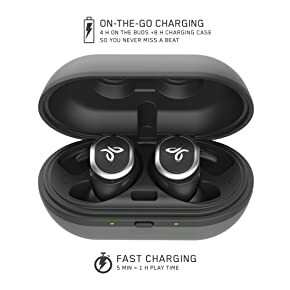 So take a careful look at the wireless headphones on this list, determine what the best choice is for YOU, and get ready for an incredible experience. Running and working out for you will never be the same again.